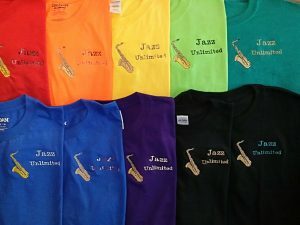 Jazz Unlimited T-Shirts for Sale! 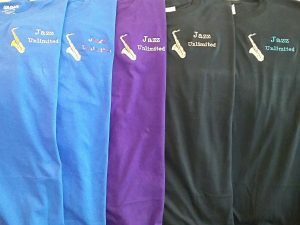 Jazz Unlimited custom #embroidered Gildan quality T-Shirts created by the gifted Vice President Natalie Groth Zweck. These unique vibrant shirts are exclusively available for purchase at all our events​. Please see our Open Jazz Jams, Jazz Concerts, and Monthly Board Meetings on our calendar page. Most sizes available. All special orders must be paid in advance. All proceeds go directly to the Jazz Unlimited Scholarship Fund and the remaining balance covers supply costs. - All purchases are tax-deductible.